Protect your car, its contents and also start the engine from inside your home or office. AstroStart RF system transmitters use Spread Spectrum Technology (SST) and Advance Encryption Standard (AES) to offer ultimate security and immunity against signal jamming and interception. The result is a rock solid range of up to one mile range. * SST uses digital frequency hopping and multiple frequency transmission to insure that if a frequency is blocked, the signal still goes through. SST also uses dual error correcting systems to combat signal data corruption and minimize signal interference. If you already have a compatible AstroStart remote start system in your car, the DSMU200 and DSMU250 will add SmartStart capability to your system. 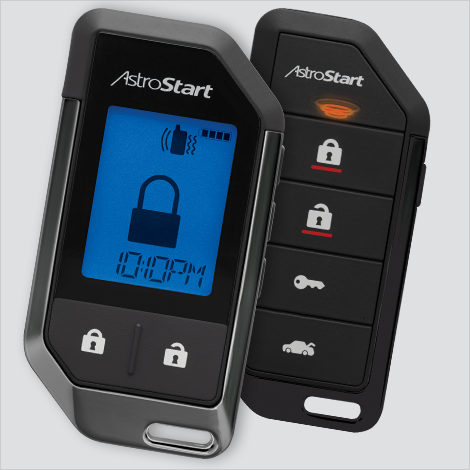 Now you can remote start or lock and unlock your car just by pushing a button on your Smartphone using the exciting new AstroStart SmartStart app from Directed. The simple graphical user interface gives you control over the following features of your installed AstroStart remote start or remote start and security system: Lock/arm, Unlock/disarm, Remote Start, Trunk release, Panic or car finder. You can also control multiple vehicles – great for families! – and assign more than one user to control a vehicle. It's easy with SmartStart! Inside, the AstroStart Elite transceiver is powered by a 4 MHz microprocessor running HDR and HDX technology for better immunity against RF interference and advanced function control providing up to 3,500 feet of range. * The tactile and aesthetic qualities of these new remotes are remarkable – cool, smooth and slim. Advanced Encryption Standard (AES) is a symmetric-key block cipher algorithm and U.S. government standard for secure and classified data encryption and decryption used to protect classified information and is implemented in software and hardware throughout the world to encrypt sensitive data. I recently purchased this starter for my manual car and I'm in love with it! Saskatchewan winters can be super cold and I finally had enough of walking outside to start my car! Now I click the key, it sings back to me to let me know it started and by the time I get to my car.... My car is toasty warm :) The buttons can get a little confusing but I'm also still learning all of them! Highly recommend this starter!